The NIRSA Member Network serves as a vehicle for communication between NIRSA’s many leadership groups and our diverse body of professional and student members. The Member Network—which consists of NIRSA’s Regional Representatives and the Student Leadership Team—focuses its efforts on outreach, engagement, advocacy, networking, oversight of NIRSA’s State/Provincial Directors and Student Leaders, and the facilitation of regional educational opportunities. NIRSA’s Member Network helps to coordinate activities and communication between Members— especially on the local and regional levels. Regional Representatives work alongside the Student Leadership Team as NIRSA leaders committed to ensuring Members in their area have the information and resources they need to do their jobs well—they also serve as advocates for their constituents to NIRSA policymakers on the national level. The Member Network is part of the Regional Leadership Team and works closely with State & Provincial Directors and Student Leaders to deliver a wide variety for members and non-members to engage with NIRSA. As our association continues to grow, NIRSA’s Member Network and its Regional Representatives are here to connect you with information, support, and opportunities. You are encouraged to directly contact your Regional Student or Professional Representative with your questions, suggestions, and ideas. The Member Network includes seven Regional Representatives from each region, seven Regional Student Leaders from each region, the Member Network Chair, the NIRSA Student Leader, the Past Presidents Representative, and a NIRSA Board of Directors Representative. Interested in applying for a position on the NIRSA Member Network? Learn more about the Recruitment & Application process. The Member Network expands and enhances the strong regional network of NIRSA and creates numerous opportunities for member involvement and leadership development. The Member Network’s focus is on outreach, engagement, advocacy, local constituent communication, nurturing and developing Members regionally, networking, grassroots growth of the field, overseeing the State/Provincial Directors and Student Leaders, and facilitating regional education opportunities. In order to prevent a situation where all seven Regional Representative terms would expire in the same year, an every-other-year staggered term system was recommended by the Governance Transition Team and adopted for the Member Network. In even years, Regions II, IV, VI, and Canada will elect a Regional Representative from their region for a two-year term. In odd years, Regions I, III, V will elect a Regional Representative from their region for a two- year term. Current Regional Representatives in Regions I, III, and V are serving the 2017-2019 term. Links to the position descriptions for Member Network positions can be found below. If you have questions about the positions on the Member Network, please contact your Regional Representative or a member of the Student Leadership Team. Check out the September 14, 2016 #RecChat Google Hangout video conversation to learn more about what it’s like to serve on the NIRSA Member Network. During the recruitment and application period of July to September, members are encouraged to forward names of qualified candidates to the Member Network by sending the person’s name and school to elections@nirsa.org or a member of the Member Network. The Regional Representatives for Regions I, III, V and Canada are elected to a two-year term during odd numbered years. These positions will be open again for the 2021 elections. Regional Representatives for Regions II, IV, and VI are open for the 2020 elections. Regional Nominations & Appointments Committees will recruit members, review applications and supporting materials, and determine the slate of candidates for each region. The final slate of candidates will be certified by the NIRSA Nominations & Appointments Committee and announced in mid-December. Electronic elections will occur in mid-January, with results announced shortly thereafter. Selected Finalists will be invited to submit a complete application. The application, will include a brief bio, answers to specific leadership questions, three references, a photo and letter of institutional support. The final slate of candidates will be approved by the current NIRSA Board and announced in mid-December. Electronic elections will occur in mid-January, with results announced shortly thereafter. NIRSA Student Members will elect their NIRSA Student Leader annually. The recruitment and slating process for this position is conducted by a subcommittee of the NIRSA Nominations & Appointments Committee, which includes the current and previous year’s NIRSA Student Leader. Deadline for this year’s application process is mid-October. The committee will then invite finalists to submit the NIRSA Student Leader application package by early November. Selected Finalists will be invited to submit a complete application. The application, will include a brief bio, answers to specific leadership questions, three references, a photo and letter of institutional support. The final slate of candidates will be approved by the current NIRSA Board and announced the week of mid-December. Electronic elections will occur mid-January, with results announced shortly thereafter. If you have questions, please feel free to contact Cheyanne Clouse 2019-2020 NIRSA Student Leader. 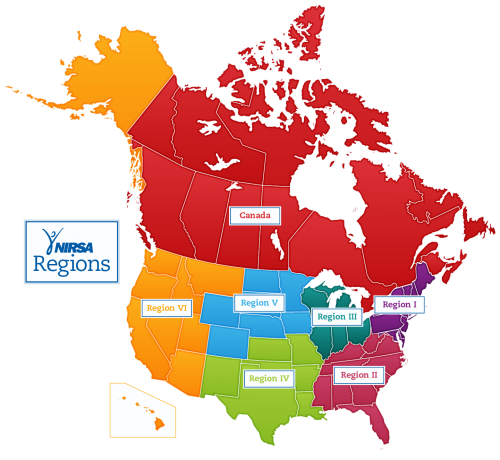 NIRSA Student Members in each region elect their Regional Student Leaders annually. The recruitment and slating process for this position is conducted by regional committees headed by current Regional Student Leaders. The final slate of candidates will be certified by the NIRSA Nominations & Appointments Committee. Deadline for this year’s Regional Student Leader application process is still being determined, will be either mid-October or early November, 2019. Electronic elections will occur mid-January, with results announced shortly thereafter. If you have questions, please feel free to contact Cheyanne Clouse 2019-2020 NIRSA Student Leader, or a member of the Student Leadership Team. If you have questions, please feel free to email nirsa@nirsa.org.